It’s the beginning of a new year which means it is the perfect time to go through all the things and cleanse your home of things you no longer want or need! 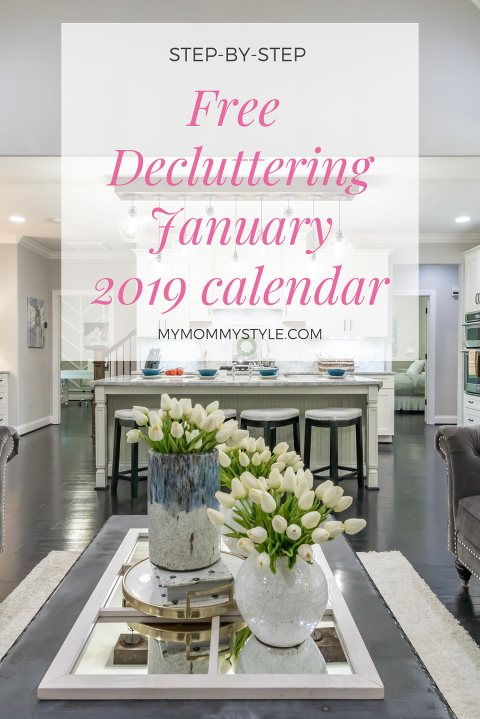 Here is your free 2019 Weekly Declutter Calendar to Organize your Home and set your mind at ease. 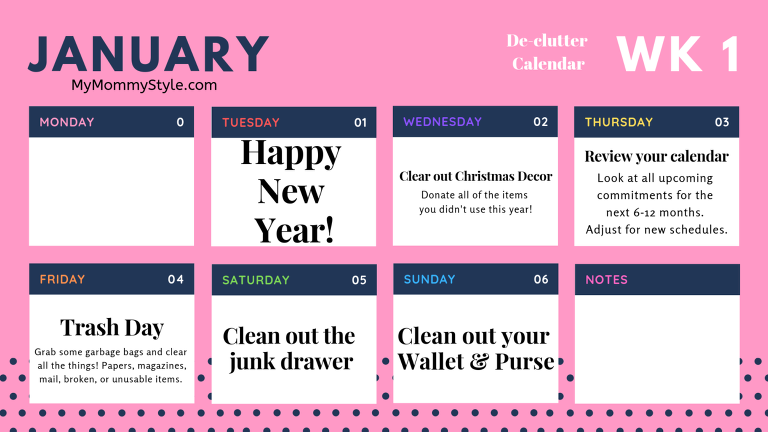 I broke this declutter calendar into weekly themes so that you can make room for the things you really want and enjoy. I have found that the less “stuff” I have lying around the more clear my mind is and I am actually able to enjoy the items that I truly love. Have you read Marie Kondo? I did love the idea of making a home for all of your things, it was a bit overwhelming to me as a mother as it is not just me and my belongings…I have a family full of six people and all of their belongings to consider. This calendar is a bite size approach of daily tasks to make the seemingly impossible, possible. This is to give you a kick start on all the clutter. Get over the mayhem of Christmas. Clear out the papers, junk drawers, and calendars. 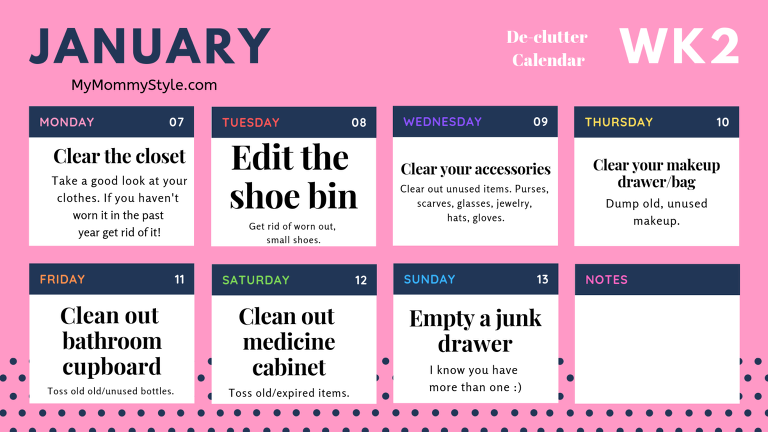 Week Two: Declutter all your things. Clothing, shoes, accessories, makeup, bathroom, and medicine. Undoubtedly you will create a bigger mess than before you started with this one. I set up bags or boxes that are to throw away, donate, or put into the right place. Set a timer and get to work. This week is primarily about you and your belongings. This area should be a fun place to start because it is focusing on the things that you use on a daily basis. Try really hard not to get hung up too long on what goes and what stays. Typically, I will put everything that I feel like I want to clear out in a bag and give myself a week or so to see if there is anything I truly feel like I am going to miss. Put it somewhere out of sight like the garage, basement, or in back of the closet and see if you can live without it. Chances are, you’ll be surprised how much you don’t need it! Week Three: Declutter your kids! Decluttering toys, kids clothing, and games can be a daunting task. Take this one day by day and even break it up in you need to. Maybe you could do an hour or two in the morning and then another hour in the afternoon. Depending on the ages of your kids it may be best to do it with them or without them. My youngest had no problem sorting through all of the things that we needed to get rid of, while my oldest is very sentimental and has a hard time throwing anything away. Make sure not to throw anything away that is truly sentimental, as a mom I know which things I can throw away without asking, and when I’m in doubt I ask. This year I asked my daughter if she was ready to donate her Barbies, she just turned eight and I thought she might be ready to pass them on. She said she wasn’t quite ready to donate them and I was okay with that. Week Four: Declutter your kitchen. This will help you to move forward into the new year smoothly. Clearing out the drop zones will help the kids know where to put their things when they are coming and going from school. One thing that has helped me the most is having hooks that they can reach for their coats and backpacks. You can see more of my command center here. I will be sharing their chore charts soon. Also, another thing that has helped us tremendously is having two hooks behind each of their bedroom doors where they prep their backpack and outfit the night before. Access this printable with the link below! I hope you found this helpful! You can follow along with my decluttering journey on @mymommystyle on instagram. Tag me in your stories or photos, I’d love to see the progress you’re making!